[KANSAS FLINT HILLS] — In the middle of Kansas, the breadbasket of the US, lies the Flint Hills — hundreds of thousands of acres of tallgrass prairies, open rangeland with very few trees, even less fences and the best grazing land in the country. 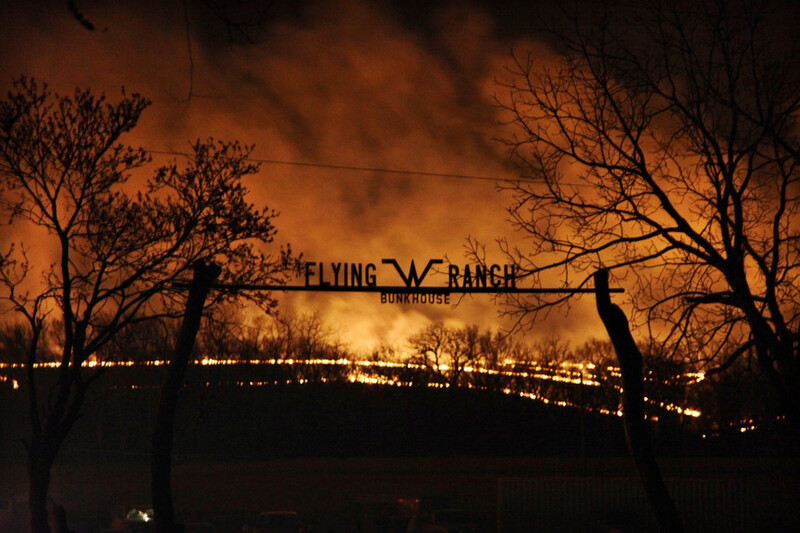 The Flying W Ranch and the Clover Cliff Ranch in Chase County, Kansas has put on this cool shindig with their cousins and neighbors since ’96. 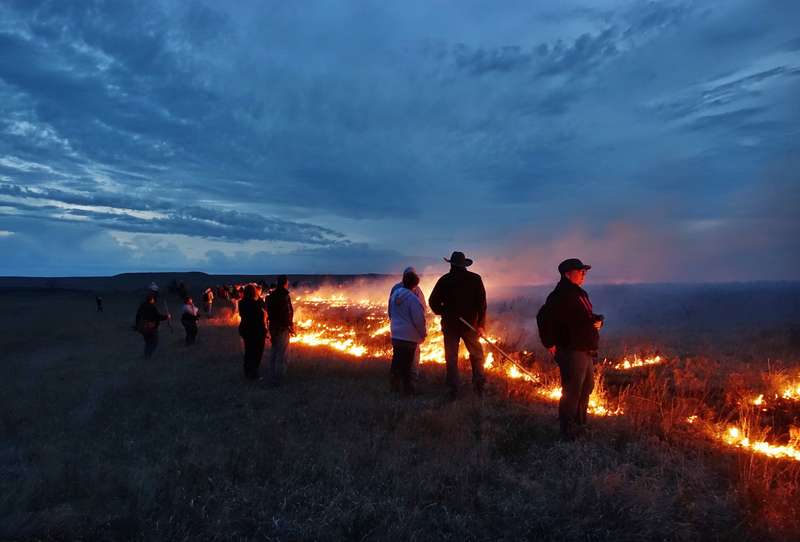 Called Flames in the Flint Hills, they attract a couple of hundred people from all over the country every year. 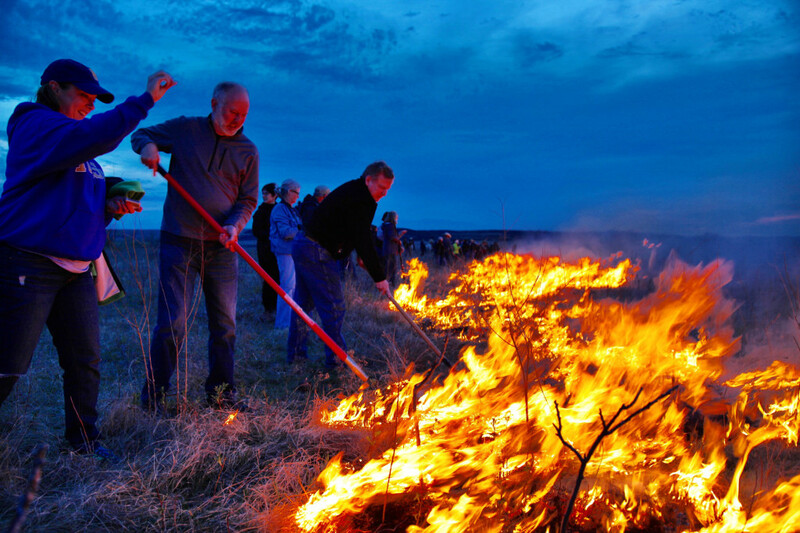 Do they need all these city slickers to help them light the prairie on fire? No. 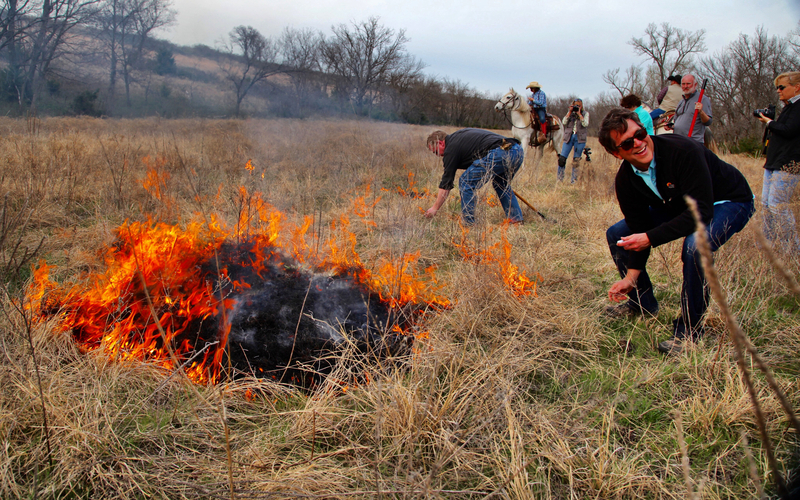 But they started this as a way to spread their ranching heritage, educate about this centuries-old practice and are crazy enough to let fire-crazy people like me light the fields afire. 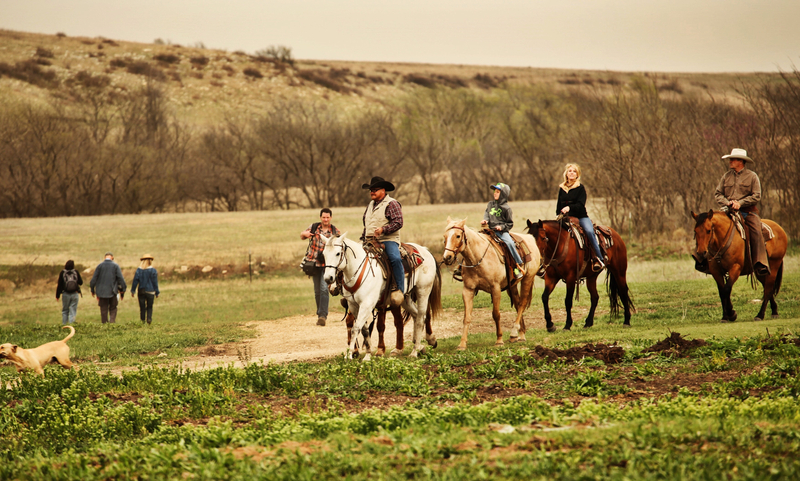 The Flying W is a 7,000 acre working cattle ranch, with about 50 horses, hundreds of cattle, bunkhouses for guests and cool events all throughout the year. Every summer, ranchers ship cattle from as far away as Texas to fatten up on the thick grasses of the tallgrass prairie that we’re about to help regenerate for the upcoming season. Not from corn, grass. As it should be. Cattle will put on several pounds a day eating all that thick tallgrass, which is loaded with mineral-rich nutrients from the flinty soil. Some say this is the best beef in the world. All because of this magical stony soil. Flying W will host about 2,000 head of cattle every summer, here, like us, to eat up the good stuff. 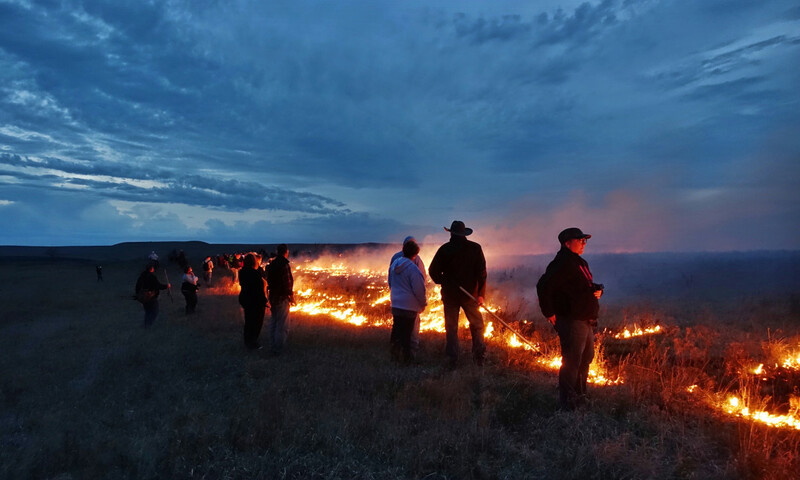 Flames in the Foothills is an all-day event, people can stay in bunkhouses on the ranch, in nearby towns and B&Bs, then come Flame Day, everyone heads to the Flying W for all-day events, music, storytelling, barbecue, hayrides and two big prairie lighting events that last late into the night. This is one of the coolest things I’ve ever done, I highly recommend it. Book now, it usually sells out long in advance. These cowboys choreograph this thing like a bunch of Frenchmen… it is magical. Here’s some more info in this great article from the Chicago Tribune. 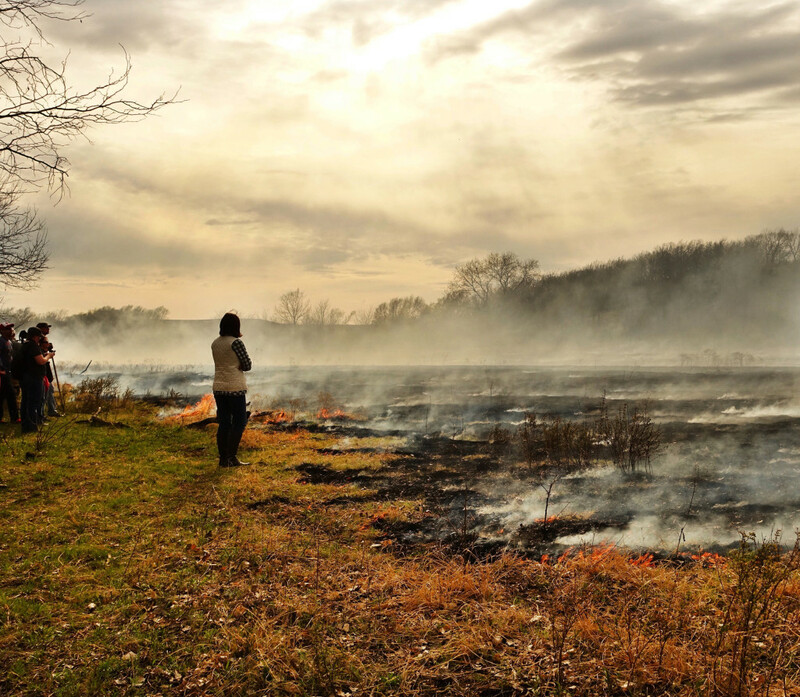 And the Nature Conservancy, who are doing an amazing job here. And the Kansas City Star. The day starts off at the Flying W Ranch, an enormous cattle ranch. There are events throughout the day, with horseback riding, hayrides, games and a steak dinner. It is a picture-perfect ranch. Count how many shades of beige are in this shot. Like a Tribeca apartment. The ranch allows about 200+ people to participate. There’s a day-burn to get everyone accustomed to their roles. 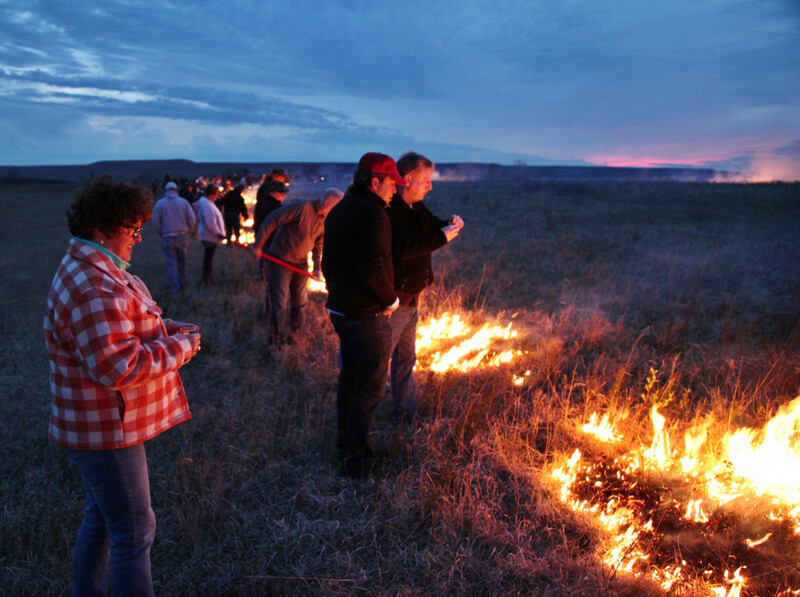 Lined up in a selected field, instructions are given, matches are handed out. And then it just goes…. 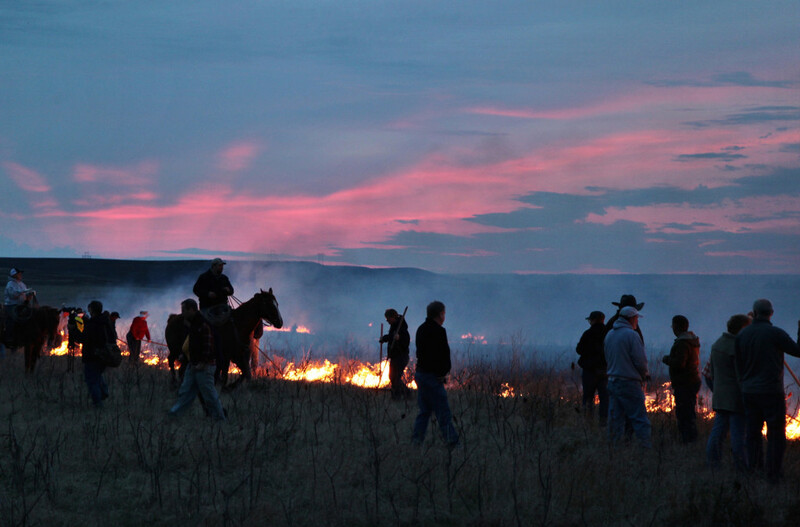 We all were expecting some sort of out-of-control range fire that we’ve all been grown to fear and flee, but the mood is very calm and controlled under the watchful eye of the awesome cowboys of the ranch. And it is actually quite mellow, the grass crackling right at our feet. …and then it’s time to eat. It’s the real deal. A full-on Cowboy Experience. 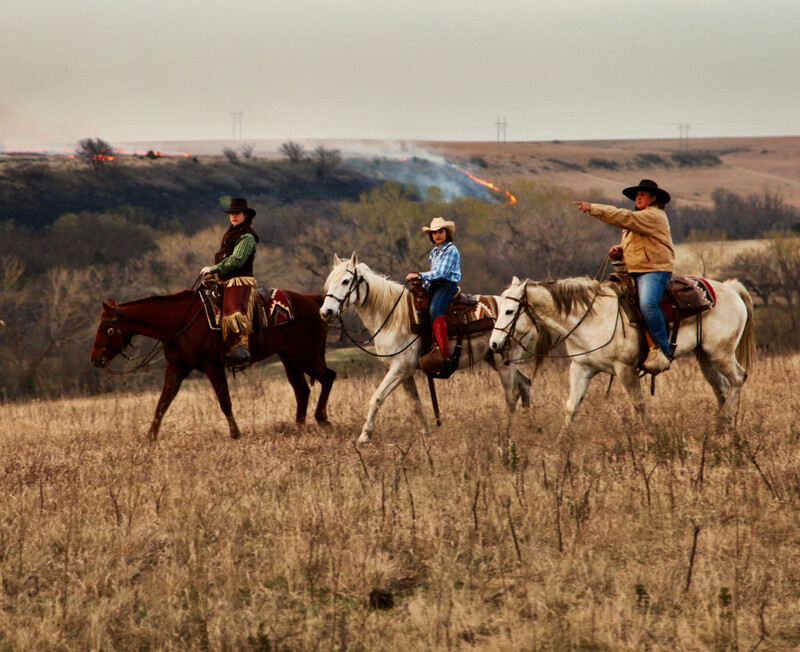 The Flying W Ranch in Chase County, Kansas has put on this cool shindig with their cousins and neighbors since ’96. 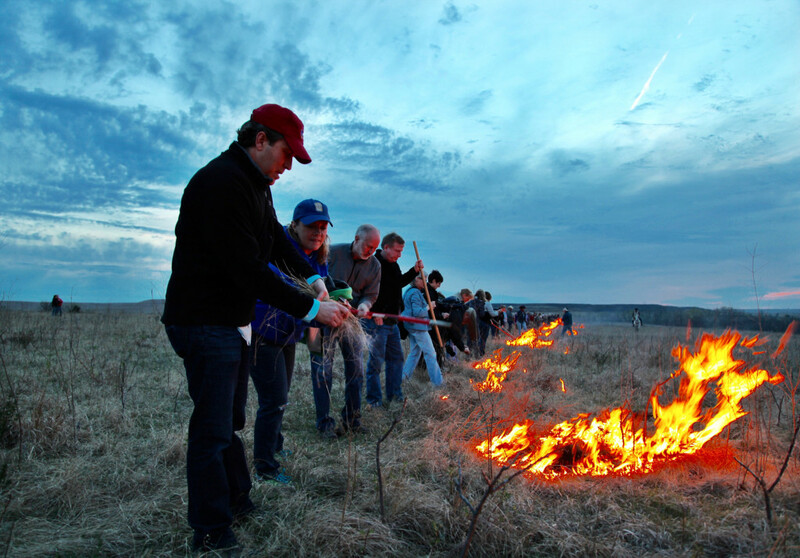 Called Flames in the Flint Hills, they attract a couple of hundred people from all over the country each spring. This is Josh Hoy who runs the ranch with his wife, family and dozens of cowboys…including his adorable daughter Jose, who knows her way around a horse and a lasso like the experienced hands. After dinner, it’s time for the night-burn and we all head up to another hilltop to start again. Normally when people see fire, they panic. 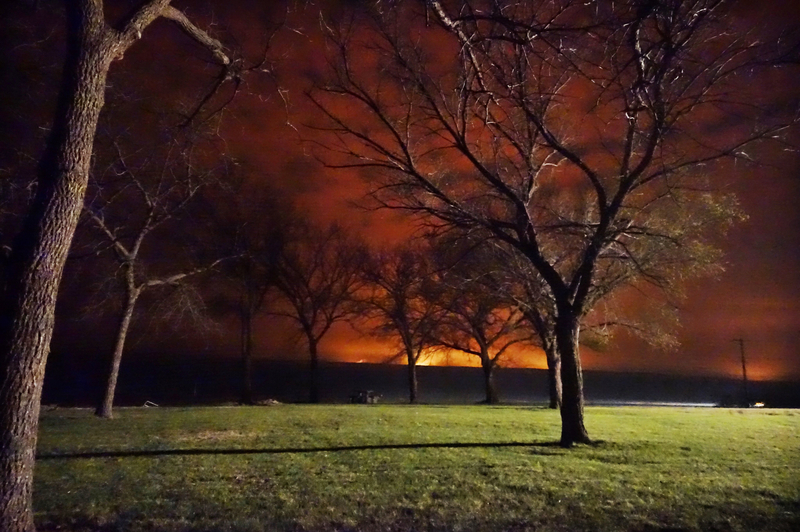 But we were all surprised at how mellow this whole thing was, setting fires. I think about the only tension was trying to get all these city people to listen to directions and form a straight line. We failed on both counts. Thats’s Gwen Hoy and her cute as a button daughter Josie, the 6th generation of ranchin’ Hoys. This is their home place. Gwen’s big hat is impressive. 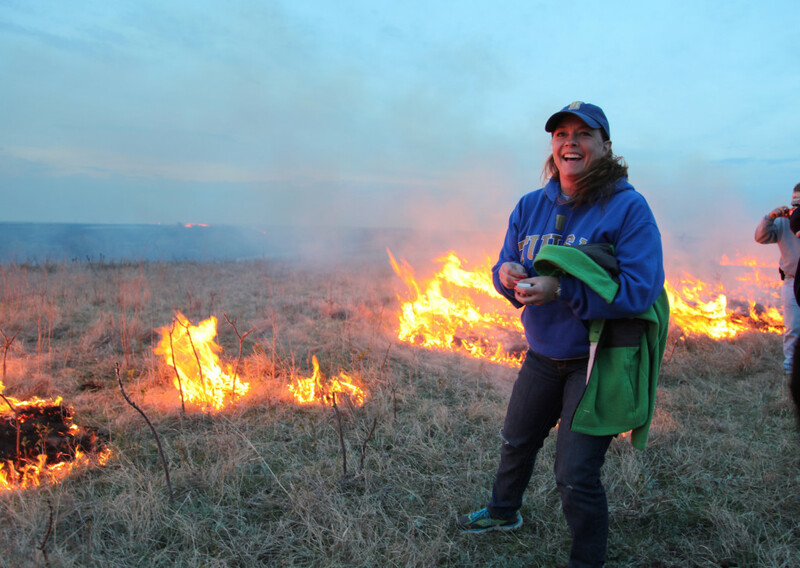 We were absolutely giddy pyros…all 200 of us. Grinning, lighting and snapping pictures. There’s actually a technique to lighting things on fire, we learned. You throw the match to get things jammin’, then you take a rake (provided) and drag that business around, Picasso-like, all over the ground. It gets busy, fast. The stuff lights up like it has gas on it… because, well, it’s fire. (Don’t try this at home. 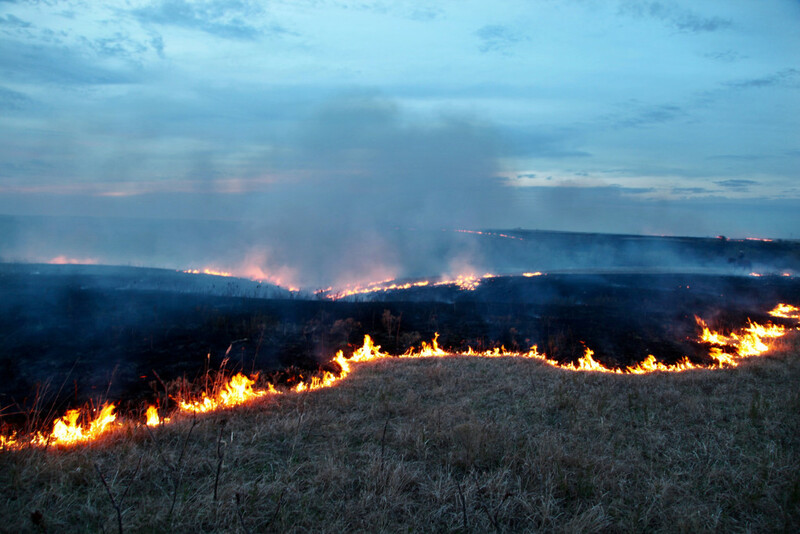 ) You monitor your perimeter and don’t go willy-nilly draggin’ it around — you don’t want to burn up your friends. And you’re trying to look like you got it for the cool cowboys (and cowgirls!) My buddy @marktarry with the rake, a famous art director, mastered it instantly, like he always does, painting pictures with big broad strokes of fire, coloring inside the lines. Looks like a reverse lava flow. But it’s Kansas. Instead of the earth having acid reflux, we did this. This is when these awesome Kansas cowboys (and cowgirls!) have stagecrafted this whole thing like they were French. After a marvelous steak cookout under the cottonwoods by the creek, we all march up the cow trails to a high pasture, right as the sun was setting, down to the minute. The light, perfect. Backs to the wind at the far edge of a pasture, we get to work; lighting matches franticly, like Leo for his life in The Revenant. Instantly, a line of fire trailed down to the sunset. People side by side, grins, ear to ear. Just to keep us on our toes, the ranch’s hands start off on distant hills and get another fire going behind us, surprising us to see yet another fire…just for our visual benefit. Centuries before Burning Man, there were men, burning. Fields of grass, not weed. Maaan, these horses are cool. You often see “fun horses” — on trail rides, your rich friend’s hobby, pulling a carriage, in parades. You always hear about horses easily getting spooked, but these are “working horses”, they’re used to cutting cattle, snake-steppin’, bison-scootin’ and fearlessly taking on anything. Almost like a Kansas version of Street. The way they calmly moved in and out the flames was just so cool. Fearless. Strong. The real deal. 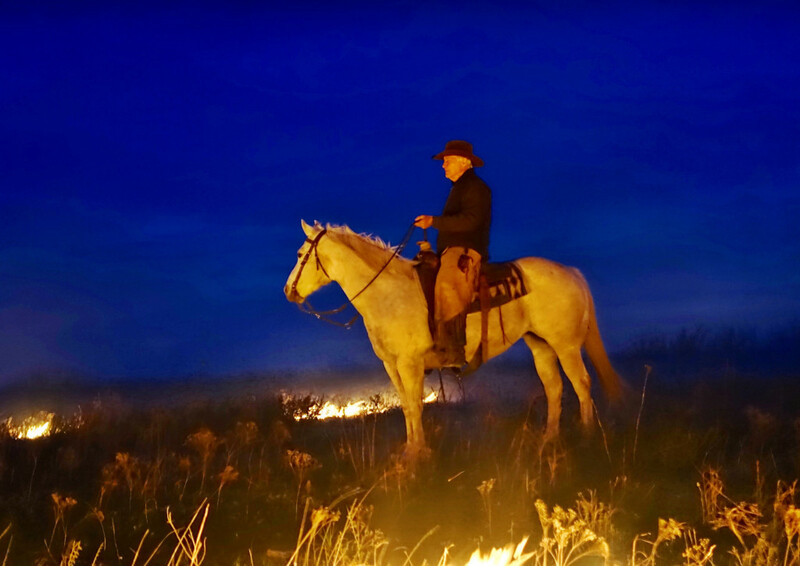 That good looking, stoic cowboy from Central Casting is the patriarch of the family, Dr Jim Hoy, a PhD, college professor, author of nine books, expert in Medieval English history, the Australian outback and a cowboy folklorist, especially about these Flint Hills. He was just honored as Kansan of the Year, you should see his cool Facebook page…. And as we all leave, choreographed like a Frenchman did it, all the hills were ablaze as we drive back to our hotel, torched hilltops leading the entire way, for miles.